I love using blank laminated paper for all sorts of schooly things (handwriting practice, math problems, drawing, etc) with either a wet- or dry-erase pen, depending, so thought that this might be a possibility for my daily To Do list as well. I bought some pretty scrapbook paper, trimmed it to fit the laminating film, then divided the paper into morning, noon and night. 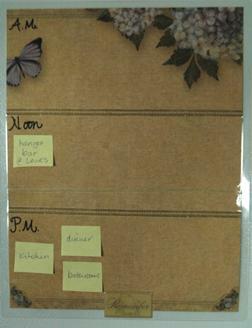 Next I laminated the paper, put a removable sticky strip on the back and put it on the refrigerator. I trimmed sticky notes to about 1″ inch square and wrote one task per sticky and put them on the appropriate part of the day. As I do each task, I simply take that sticky off my list and throw it away, gone forever, leaving a blessed oasis of nothing in its place. < e x h a l e > It’s a wonderful thing. This entry was posted on Monday, July 20th, 2009 at 3:14 pm and is filed under organizing. You can follow any responses to this entry through the RSS 2.0 feed. You can leave a response, or trackback from your own site. …you are such a creative lady! Would you mind coming on over here and helping me get my life in order….i so need pretty! You’re welcome Elizabeth. Thanks for stopping by! What a cool idea! I love this. I like that you can move the tasks around! Thanks so much, Angela. I’m glad that it’s helpful! Enter your email address if you enjoy this silly blog and just have to have more. But only if you insist. © Copyright 2008-2011. Life in the Garden | Jennifer Sinclair. All Rights Reserved.